Old Testament - Today in Leviticus chapter 20 verses 23 & 24 we read - "Do not live by the customs of the people whom I will expel before you. It is because they do these terrible things that I detest them so much. But I have promised that you will inherit their land, a land flowing with milk and honey. I, the LORD, am your God, who has set you apart from all other people." These verses are another reminder that God's laws to the Israelites were given to set them apart from the pagans surrounding them and in Canaan. God's laws were given to differentiate what is right and wrong, in comparison to the pagan immoral customs. I wonder about this in our modern world today. As followers of Jesus, do you think we should be "set apart" from what the modern world tells us to do & how to live? Should we or should we not be living by the customs of our modern world? How are you living your life today? If someone examined your life, would they see that you are set apart from the customs of our modern world? Bob Deffinbaugh's commentary on Leviticus chapters 21 & 22 is at this link. A sermon from Peninsula Bible Church on Leviticus 21 & 22 is at this link. 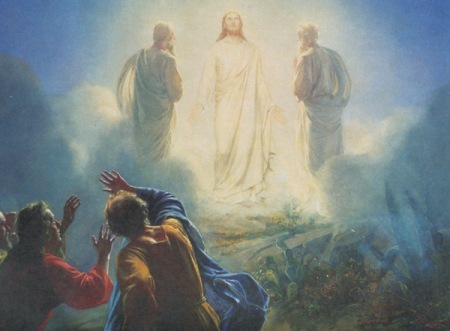 Commentary on the Transfiguration is at bible.org at this link. Verse 24 is an amazing statement from the father of a possessed boy to Jesus- "The father instantly replied, "I do believe, but help me not to doubt!"" I have heard this verse mentioned by the late great writer Henri Nouwen. One of his simple prayers that he would pray very often - throughout his day - was simply, "Jesus, I believe. Help my unbelief." I know that I have uttered this prayer on occasion in the past and it's been an amazing little prayer to pray - at any time of the day. Jesus, I believe. Help my unbelief. Psalms - I think Psalm 43 verse 5 starts off with a couple of questions that then answer themselves by the end of the verse - "Why am I discouraged? Why so sad? I will put my hope in God! I will praise him again--my Savior and my God!" I would agree with what this verse is getting at. If I find myself to be discouraged or sad, it comes as no great surprise to me that I have been putting my hope in things other than God. I have been perhaps even praising false idols. And the sure fire way to be freed from the discouragement or sadness? To put my hope once again in God and God only. And to praise him again! I think this Psalm verse is a great reminder to make sure we are not placing our hope in anything other than God. For anything other than God will truly only leave us empty in the end. Proverbs chapter 10 verse 18 in today's readings is a great reminder that it is foolish to hate or slander others. Mike, you conveyed my thoughts perfectly this early morning hour. I too shall pray for more belief and turn to God for hope. The sun will rise soon this morning but even in the light of day, those doubts, worries, etc. that beset me will still be there. Only God can wipe them away, and with me it is a continual battle. Praise God that he never tires of me! An incentive for living a holy life are given to the Hebrews at the very beginning of this passage, 22"You must carefully obey all my laws and regulations; otherwise the land to which I am bringing you will vomit you out. This imagry of a land actually vomiting out its inhabitants has taken hold of my imagination. So even if you don’t understand why God is desirous that His people be holy, because He is holy, even if you don’t understand what are the rituals have to do with holiness, then the desire to have a place of one’s on should be an incentive to submit to God’s plan of action. "Do not defile yourselves in any of these ways, because this is how the people I am expelling from the Promised Land have defiled themselves. 25 As a result, the entire land has become defiled. That is why I am punishing the people who live there, and the land will soon vomit them out. 26 You must strictly obey all of my laws and regulations, and you must not do any of these detestable things. This applies both to you who are Israelites by birth and to the foreigners living among you. 27 "All these detestable activities are practiced by the people of the land where I am taking you, and the land has become defiled. 28 Do not give the land a reason to vomit you out for defiling it, as it will vomit out the people who live there now. 18 Yet what we suffer now is nothing compared to the glory he will give us later. 19 For all creation is waiting eagerly for that future day when God will reveal who his children really are. 20 Against its will, everything on earth was subjected to God's curse. 21 All creation anticipates the day when it will join God's children in glorious freedom from death and decay. 22 For we know that all creation has been groaning as in the pains of childbirth right up to the present time. 5 "Teacher, this is wonderful!" Peter exclaimed. "We will make three shrines--one for you, one for Moses, and one for Elijah." 6 He didn't really know what to say, for they were all terribly afraid. When God has invited me to share in something so spectacular that it defies words, do I become like Peter, feel I have to just say something for the sake of saying something? Do I develop diarrhea of the mouth and spew out anything, instead of just keeping my mouth shut and observe and learn? Once down from the mountain, they are met with a great cacophony of sights and sounds, unlike the Divine Order presented to them on the mountain, although the disciples didn’t know it was order. Someone wanted their son healed, the disciples couldn’t do it because they lacked the necessary faith and lifestyle to accomplice the task. In order to be ready, I believe a lifestyle of holiness (hmmm, what we are covering in Leviticus) must be adhered to in order to be effective. That doesn’t not mean we wait for our church to call a special prayer meeting and time of consecration, it means to be effective in ministering to the needs of people we come into contact with daily, we have to live a fasted prayerful lifestyle. Both Psalm 42 and 43 end with the same refrain, 5 Why are you sad, O my soul? Why have you become troubled within me? Hope in God, for I will praise Him again, my help and my God. The Psalmst is in trouble and he is wrestling with how things appear and the character of God he has been taught and knows. He is dogged by trouble and in distress, yet He knows the character of God, so he has ended each statement with self-talk to his soul. He is trying to get his soul filled with the information his spirit and mind knows about his great God. These two Psalms give a picture of someone rehearsing within his own hearing and in the hearing of God, “The facts Ma’am, just the facts.” It is like he is standing in a mirror presenting evidence before his own self while God listens. I have been in the Psalmist place a multitude of times trying to override the panic within my own soul with the evidence, albeit unseen, of the knowledge of God and what He will do for those who call on Him. All I can say about this passage is that it is a call to “Get Real” with God and yourself. Call out whatever is there within in you and God will take care of the rest! !